yep, flattened. Ugh. I’m not going to go to that much trouble. She also drilled and screwed them to the form, which sounds like a loooottt of work. When I showed my horse-obsessed child and asked her what she thought this piece was made of, she said, “Scales.” Huh. I dismissed it at the time, but later thought, you know, if I ever get some time (doubtful) it would be fun to take larger sequins and make it. If her horse obsession continues, I may. Wow! Those are truly amazing. I’m trying to imagine her working on that horse and sorting pennies by subtle variance in color. Oh my! I don’t think many of us have the time or patience for that project! Damn! Time to start squashing pennies…. Holy moly that horse head is amazing! I just love it! 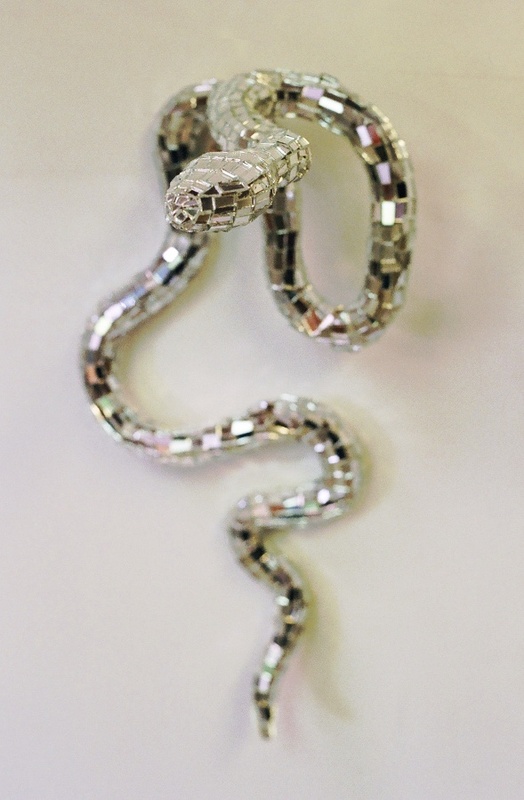 And the mirrored snake is my second favorite – you? I am not a big snake fan so even though the snake is pretty cool I would be a bit creeped out if it were in my house! Wow. That horses head is fantastic – she still managed to get detail into it even though she was using coins. Exactly! So unbelievable…I really love the horse and snake. I see the horse made out of pennies and my thought was can you make one out of old betting slips from the track? Now that would be good because of the irony of it! Very creative. I love the horse. Hope all is well Kearney. Wow, that is a interesting horse head and to flatten every penny. The time that must have taken to make. Is beautiful, though. Totally enjoyed this post. Thanks for sharing Rachel’s work. A-mazing! Wow. That woman has a really unique talent. I hope she didn’t actually flatten the pennies by letting a train run over them on a railroad track. That’s extremely dangerous and illegal in most areas. 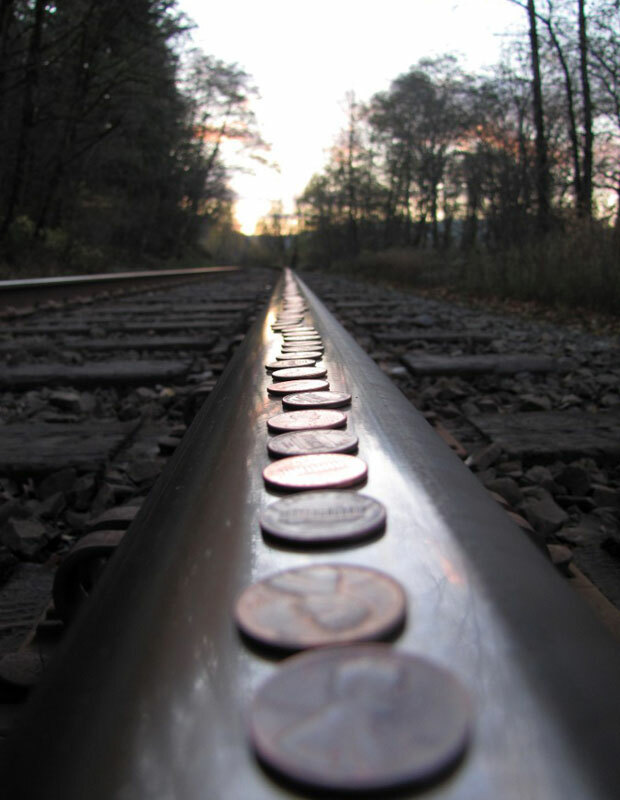 The train tracks are private property and putting things on the tracks is illegal under federal law and under many state laws, even things as small as pennies. Here in the United States there are significant penalties including monetary fines and prison time for such acts. Then you do have the federal crime of destruction of currency. Very neat artwork! Perhaps you could look into using plastic spoons and super glue as an alterntive for your horse project. Then you could just sponge paint the likeness or paint it to match your daughter’s room. I have also seen an artist use chicken wire to make a scuplture of three horses appearing to ‘burst’ out of the wall. Looked very neat hanging in that lawyer’s office. Just amazing! I love the copper horse! That horse head is AWEsome! Haha love the pretty woman refernence! 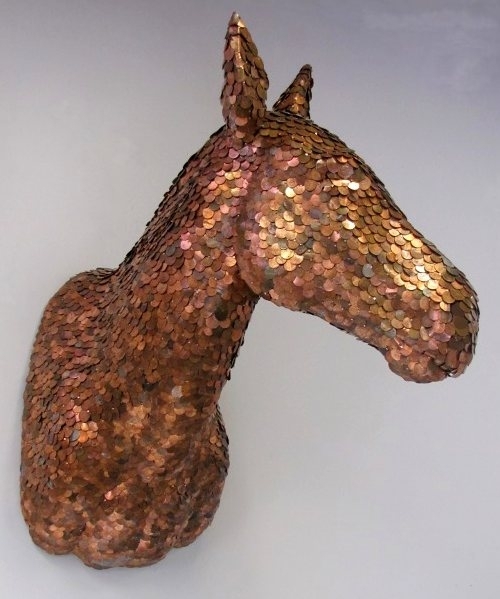 The coin horse is so cool… But yes, would take alot to DIY! I love flattening pennies on railroad tracks! I think that is the best compliment I’ve ever received here!! Admittedly, I wasn’t always a diy’er, but we haven’t hired anyone to do a project for us in 10 years and now know at least 15 people at our Home Depot very well! Our aesthetic may be slightly different, but your diverse interests, topics and perspective are so similar to mine. We have the same plight with property rights (your aerial photos said it all) and I just about died at your sighting of the lynx! Thank you so much for such kind words!